Plan a trip to Universal Orlando in 2014 and get an incredible offer at the new Universal Orlando Cabana Bay Beach Resort. They have awesome family suites that sleep up to six. Hotel guests enjoy Early Park Admission to The Wizarding World of Harry Potter one hour before the theme park opens. Enjoy the resort’s 10-lane bowling alley and two massive pools with sand beaches, a lazy river, waterslide and more. Sounds like an awesome place to enjoy with your family! Learn the full details below. ORLANDO, Fla. (Nov. 12, 2013) – Universal’s Cabana Bay Beach Resort is celebrating its 2014 opening with an incredible preview offer, allowing guests to be among the first to experience Universal Orlando’s new moderate-and value-priced property, inspired by iconic beach resorts of the 1950’s and 60’s. Cabana Bay Beach Resort is Universal Orlando Resort’s fourth on-site hotel with striking color schemes and nifty, nostalgic details throughout the décor. The new, 1800-room hotel features moderately priced family suites available this spring at the special preview price and value-priced guest rooms available in summer of 2014 along with a wealth of recreation. 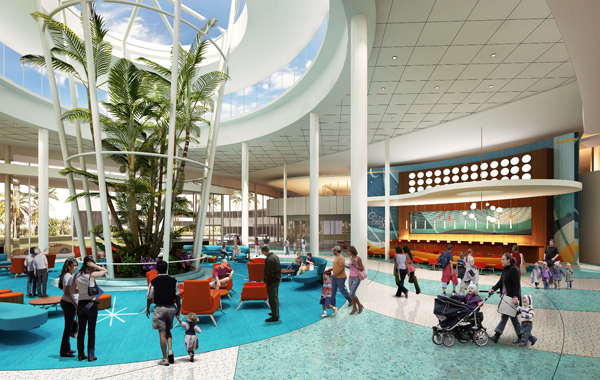 When complete, guests can experience a 10-lane bowling alley and enjoy two massive pools with sand beaches, a lazy river, waterslide and more. This preview offer is available for booking until January 31, 2014. Conditions apply. ** To learn more or to make a reservation, call 888-273-1311 or visit www.universalorlando.com. See more details below. **Pricing is per night, per family suite (sleeps up to six). **Package is available for purchase now through January 31, 2014 for travel March 31, 2014 through June 14, 2014. **Theme park tickets are not included. Headquartered in New York City, Loews Hotels & Resorts owns and/or operates 19 hotels and resorts in the U.S. and Canada including the newly acquired Loews Madison Hotel located in the heart of Washington at the epicenter of legendary D.C. landmarks and the Loews Boston Hotel, one of Boston’s preeminent historic buildings, situated on the corner of Berkeley and Stuart Streets. Located in major city centers and resort destinations in North America from coast to coast, the Loews portfolio features one-of-a-kind properties that go beyond Four Diamond standards to delight guests with a supremely comfortable, uniquely local and vibrant travel experience. For reservations or more information about Loews Hotels & Resorts, call 1-800-23-LOEWS or visit: www.loewshotels.com. I like that the suites have a kitchenette with microwave, mini-refrigerator and sink.This saves money as well because making one meal a day can save a family $40 a day. This makes the stay a really good deal!